Sinus Infection: Bacterial, viral, or fungal? Each year as fall sea­son comes upon us, we are shut indoors and infec­tions begin. For those of you who suf­fer with chron­ic sinus infec­tions, this can mean fear and dread. 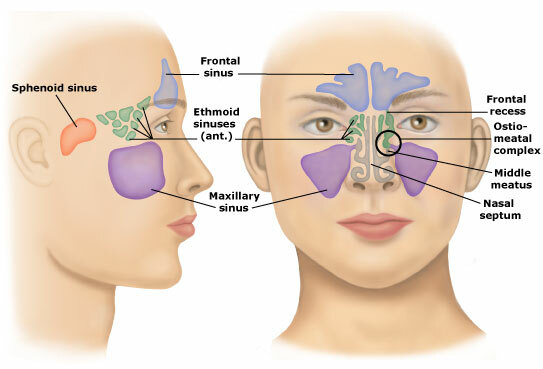 Sinusitis is basic­ally an inflam­ma­tion of the sinus pas­sages which include the max­il­lary, front­al, eth­moid, and sphen­oid sinuses. This inflam­ma­tion occurs often from the pres­ence of bac­teria, a vir­us, or even a fungus that our body is attempt­ing to elim­in­ate, but can also occur in the pres­ence of things in our envir­on­ment to which we may be aller­gic like mold, pol­len, or dust. The sinuses will typ­ic­ally fill with mucous and flu­id, our body’s nat­ur­al immune response, cre­at­ing heat, inflam­ma­tion and pain. A great deal of pres­sure in the head can occur, and can lead to head­aches and even the aching of the upper teeth if the max­il­lary sinuses in the front of the face are overly filled with flu­id. It is quite dif­fi­cult to determ­ine if sinus­it­is is just inflam­ma­tion due to a little bit of dust in your bed­room, or if there is an infec­tion with­in the sinuses, unless you are tested. However, infec­tion-based sinus­it­is can often have an asso­ci­ated cough, fever, per­sist­ent head­ache that wor­sens over sev­er­al days, bad breath, and a smell from the mucous in your nose (rare, but unpleas­ant). Bacterial sinus infec­tions will respond quickly to anti­bi­ot­ics, but vir­al and fungal infec­tions will obvi­ously not. As a natur­o­path­ic doc­tor, many of the treat­ments that we use are mul­ti­fa­ceted as in that a bac­teri­al or fungal infec­tion would be treated in much the same ways with sim­il­ar anti­mi­cro­bi­al herbs. Many of my patients who suf­fer with chron­ic sinus infec­tions rarely have ongo­ing bac­teri­al infec­tions but mostly chron­ic inflam­ma­tion that needs to be addressed in oth­er ways. Simply killing offend­ing microor­gan­isms in these instances would not be adequate, as long-term relief also includes pre­ven­tion. The main drag with sinus­it­is is that the tis­sues are inflamed and swollen, and there is a lot of mucous and flu­id that just isn’t mov­ing. Sinus rinses are fab­ulous at get­ting the sinuses going, and namely, the NetiPot, which works with grav­ity rins­ing out both sides of your nose. I prefer the NetiPot to a sinus rinse because the sinus rinse requires your to simply shoot water dir­ectly up your nose, where­as the NetiPot is a little teapot that you tip into your nos­tril (as your head is tilted to one side) where warm salt water rinses through your sinuses. Moving from side-to-side cre­ates less over­all pres­sure in tight sinus pas­sages, but also gives the eth­moid sinus an attempt to drain too (see the dia­gram above for a peek at those deep sinus cav­it­ies). Yes, it can be a little messy, but have a tis­sue box beside you and after a few rinses, you’ll see the beauty of this tool. My favour­ite points to drain the sinuses are LI 20 and UB 2, right in the front of the face. Within minutes of acu­punc­ture needles in the face, the sinuses start to drain and a great deal of relief (with the need to blow the nose) occurs! Put things in the body to reduce inflam­ma­tion, and take things out of the body to reduce inflam­ma­tion. Seems simple enough, right? Nettle and Eyebright are two fab­ulous anti-inflam­mat­ory herbs that are fab­ulous at not only redu­cing inflam­ma­tion by redu­cing histam­ine in the body (histam­ine is what allows tis­sues to become hot, fill with flu­id etc), but they reduce flu­id con­ges­tion as they encour­age flu­id move­ment out of the tis­sues. I also like to have people increas­ing their fish oils! If you’re a sing­er, the first thing you learn is that cheese and dairy are the “enemy” to your vocal cords and your sinuses for a per­form­ance. Mucous-pro­du­cing, these foods are going to increase inflam­ma­tion dur­ing an epis­ode of sinus­it­is. The same rules also apply to inflam­ma­tion or histam­ine-releas­ing foods like wheat, toma­toes, bana­nas, pine­apple, papay­as, and vin­eg­ar-based foods (pre­served olives, anchovies, capers etc). Reducing histam­ine-based foods in your diet for a few days pre­vents the body from mak­ing more histam­ine, which for inflam­ma­tion, is like put­ting gas into a blaz­ing fire. If you do have an infec­tion, there are a num­ber of revolt­ing herbs and vit­am­ins that I like to use to sup­port infec­tion elim­in­a­tion; vit­am­in C and zinc are both anti-micro­bi­al. Herbal sup­ports include the sock-tast­ing goldenseal (that can also be added in a few drops to the NetiPot to swish through the sinuses with your nas­al rinse) and the shud­der-indu­cing myrrh that while you may weep tak­ing them, they really do work. The role of nat­ur­al ther­apies for sinus­it­is should not be over­looked; there are some great tools that can really lessen the exper­i­ence of sinus­it­is and are also truly pre­vent­at­ive. Happy November!